Looking reflectively across the bird reserve at low tide, in evening light. 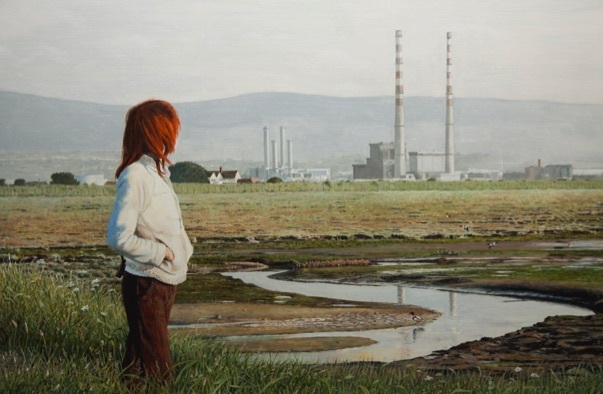 The setting in this painting is the tidal saltmarsh lagoon at North Bull Island in Dublin Bay, home to tens of thousands of wildfowl and waders. The woman’s hair and clothing echo the chestnut and white of the striking shelducks, and there is a fainter echo in the chimneys. The scene was inspired by Michelangelo Antonioni's evocative film 'The Red Desert' starring Monica Vitti, set in the industrial landscape of Ravenna.